HomeConditions & Symptoms FAQWhat is GERD? 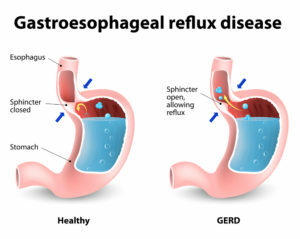 GERD stands for gastroesophageal reflux disease, a condition in which a person suffers from persistent and/or severe acid reflux. Acid reflux occurs when your LES (lower esophageal sphincter) becomes weakened or irritated, and allows stomach acid to flow up or ‘reflux’ into your esophagus. Your esophagus isn’t designed to deal with this level of acidity, so you may experience pain or a stinging, burning sensation that often centers around the heart area, which we commonly call heartburn. You’re also at higher risk if you have a hiatal hernia or a connective tissue disorder, such as scleroma. Many people experience the occasional bout of acid reflux after eating. It’s usually caused by exerting themselves too quickly after eating, overeating, or eating spicy foods, carbonated drinks or alcohol. However, if you suffer from acid reflux frequently and/or for a prolonged period, you will be diagnosed with GERD. A GERD diagnosis means you’re at risk of suffering lasting damage to your esophagus, and an increased risk of Barrett’s esophagus and esophageal cancer, so symptoms should not be ignored. Your gastroenterologist will recommend treatments to heal and prevent damage and to alleviate symptoms. What is the Medical Treatment for GERD? Depending on the severity of your symptoms, your physician may suggest various medications such as PPIs (proton pump inhibitors), H2 blockers or antacids. However, if you have severe and/or persistent acid reflux, or your LES isn’t functioning properly, you may need a surgical procedure. Currently, the primary surgical approach to tackle acid reflux is fundoplication, which is usually done laparoscopically (i.e. through small slits in the abdomen rather than through a large incision). Nissen (‘complete’) fundoplication: The upper part of the stomach is wrapped right around the lower end of the esophagus and fixed in place, strengthening the LES. Toupet fundoplication: The stomach is only partially wrapped around the esophagus, which may be recommended if you also have a motility disorder (a problem with how your esophagus coordinates its contractions).